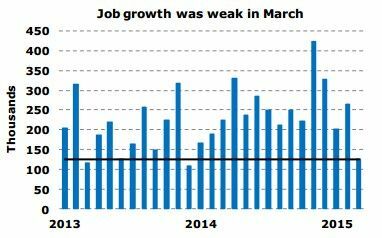 Not that the number of new jobs matters that much anymore. Nearly all of the new jobs created in the past 10 years have been low wage part time jobs often taking my seniors coming out of retirement to work at McDonalds. Given the huge numbers of high school seniors and college graduates entering the workforce each year, It would take 200,000 new jobs per month just to “break even.” So 125,000 new jobs in March 2015 means that another 75,000 joined the ranks of the invisible unemployed. These kids cannot even collect unemployment benefits because to be unemployed, you have to first become employed. But perhaps even more shocking was the table for employment here in Washington state, the software capital of the world. Notice anything unusual here? First, look at the change in software jobs from 2013 to 2014. For the entire year, not a single new software job was created! There was 54,900 software jobs in 2013 and 54,900 software jobs in 2014. According to a friend of mine who works in the Employment Department at Microsoft, less than 1,000 of these computer programmers are actually from Washington state. Most were imported from sweat shops in India. US programmers were required to train their replacements who were willing to work for much less than US programmers. Meanwhile, the Washington state legislature gives Microsoft a tax break of nearly one billion dollars per year by allowing them to pretend that Microsoft is located in Reno Nevada instead of Redmond Washington! Wait a minute. Wasn't the point of Common Core and the high stakes testing to raise the bar so our kids could get all of those new Hi Tech jobs? It turns out the entire thing was a farce – a marketing slogan – designed to get parents to accept the abusive corporate takeover of our public schools. There are no new software jobs waiting for our kids when they graduate from high school and/or college. Here is a link to how the myth of Hi Tech jobs was promoted in order to convince Congress to increase the number of H1B workers allowed into the US. 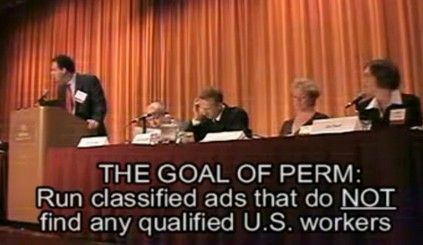 Watch in the video what corporations and Congress really mean by a "shortage of skilled U.S. workers". Microsoft, Oracle, Hewlett-Packard and thousands of other companies are running fake ads for fake workers for fake jobs in Sunday newspapers across the country each week. 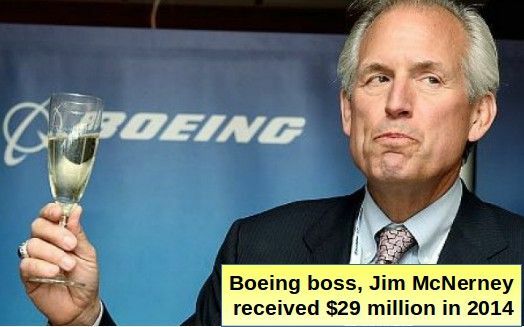 The other big pusher of Common Core and High Stakes testing is Boeing – who was given $9 billion in tax breaks just a year ago in order to create more Aerospace jobs. Take a close look at how many jobs we got for our $9 billion “no strings attached” giveaway to Boeing – the largest tax break in US history. Total aerospace jobs fell from 95,000 to 93,300 – a drop of 1,700. Thanks to massive wage concessions from the Machinists Union, the new workers are also making much less than workers have traditionally made. The Hourly wage has been cut from $30 per hour to $12 per hour. Please email your legislators. 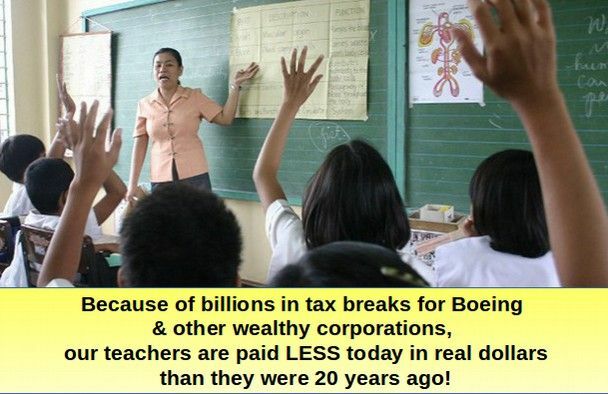 Ask them to restore school funding and economic prosperity by passing Senate Bill 6093.